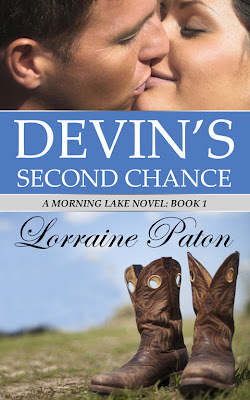 Lorraine Paton: Devin's Second Chance - Official Release Day! Today I'm thrilled to announce that my debut book, Devin's Second Chance, is now available at eBook retailers! You can sign up for my newsletter (top right side of this page) to get an email notification of special news, promotions and my next release! You can also join me over on Facebook for my virtual release party, where I'll be very generous when pouring the virtual champagne! Thank you for visiting! Let's break out the virtual champagne! A new development--I'm giving away a $10 gift card for Amazon to celebrate! To be eligible to win the gift card, please include your email address with your comment on this post! :) One name will be selected randomly and then announced tomorrow (Tuesday) morning! Thank you, Donna! :) I think this'll be a fun day! BIG CONGRATS on your first Indie release, Lorraine! Sounds like a great story. Hope you have a ton of sales! Congrats! Going to get a copy now. Thank you, Pat! :) I hope you enjoy it! I'm breaking out the virtual bubbly. :) Cheers, congrats and Happy Release day!!!! Congratulations to Loucinda McGary! You've won the Amazon Gift Card! I'll by sending it to you through Amazon shortly!